Reading and Leeds Festival as, over the years, there have been so real corkers. I say it is fitting because, twenty-five years ago; there was that now-legendary 1992 rundown. Nirvana’s infamous and epoch-defining antics were part of a heady and definitive year that saw some of the world’s biggest acts jostling for attention. This year, perhaps, there are fewer corkers but we have seen Queens of the Stone Age slip into Leeds – one suspects, they are at Reading right now! In a year where Nick Cave, Manic Street Preachers and PJ Harvey were on the bill – not to mention Public Enemy, for that matter – there wasn’t a set that could rival this career-defining Nirvana performance! Entering the stage on a wheelchair - sporting a blonde wig and hospital overalls - Kurt Cobain silenced rumours of a no-show with an epic set that included a particularly fired and intoxicating rendition of Smells Like Teen Spirit. It was at a time when Britpop was starting to wind-down and a new phase ushered in – one where American guitar music was taking more of a hold. Bands like Blur would continue and change their sound but the balloons and party poppers of Britpop were waiting to be swept up. The endless energy and defiant set from Britpop mainstays Suede kept the spirit alive and reminded people why Brett Anderson and company were/are among the finest live bands ever. It can only be a matter of time before the band is invited to perform a career-spanning set at Reading and Leeds?! Like Arctic Monkeys; here is a band used to the topography and portaloo queues at Britain’s premier Rock festival. We all know how The Libertines ended and why this performance – reunited after a six-year hiatus – was an emotional affair. The capricious and unpredictable Pete Doherty could have derailed the show but, focused and understanding the importance of the occasion, rose and shone. It led to an official reformation in 2014 – a triumphant show that was more than a pay-cheque for the boys. It was a chance to reclaim the sort of fascination and attention that afforded the band when they first burst onto the scene. Josh Homme and crew have played Leeds Festival already – sneaking in to perform a rapturous eight-song set yesterday. Homme, delighted to be there, warmed the audience up with a singalong to Afternoon Delight – the band entered the stage to the stage of Dean Martin; whipped through some Villains material and peppered some classics into the mix – to the delight of the huddled and delirious attendees. It was that kind of raw energy, personality and fun that made their 2005 set such a delight. The band played the Main Stage at Reading and, following the release of the album, Lullabies to Paralyze, it was a set that included Go with the Flow, No One Knows; Little Sister, Burn the Witch – thirteen nuggets that left the crowds very happy that night! Not long after Sheffield’s Arctic Monkeys were the band on everyone’s lips – they were afforded the opportunity to thrill the crowds at the new bands tent with a set-list that included A Certain Romance, Mardy Bum and their biggest-ever hit, I Bet You Look Good on the Dancefloor. The band went on to make several appearances at Reading and Leeds but there was something about the smaller setting and the impending fame – that stand-out song not really synonymous at that point – that made their performance one of the festival’S finest. This is one of two inclusions for the legendary American Metal/Alternative guerrillas. Arriving six weeks before their initial split; it was a set charged with emotion, tension and imminent shift. 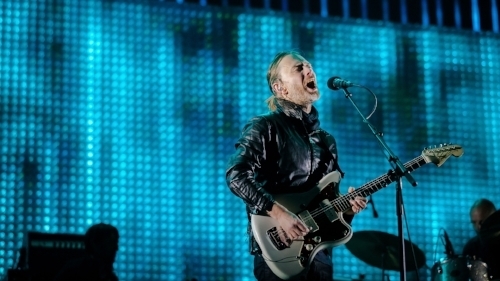 The fact the weather was less-than-reliable meant the mud-soaked surroundings added an extra layer of grit, intensity and evocativeness to a charged and electric performance. Guerrilla Radio – one of the finest renditions the band had ever performed – was a highlight that washed away the rain with ease. Surely, one of the finest live sets from the band’s later-period! 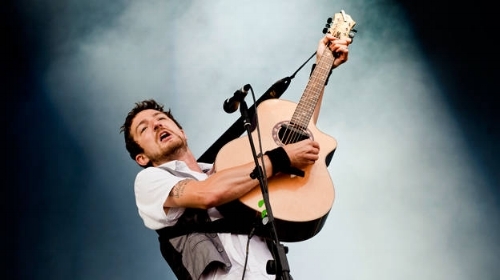 It took a little while for Frank Turner to rise to the big stage at the festival but Turner, having made his way around every other, was ready and primed to deliver. Joined by his Sleeping Souls: his set was greeted with warm and smiling sunshine; reflected by a crowd that was left in awe of a musician at the height of his powers. Playing the highlights from Turner’s third album, England Keep My Bones, it is one of the most memorable performances in Turner’s career (to date) and a moment he was born to fulfil – someone who had dreamed of ascending to the biggest stage and not disappointing when he did! Again; another band that are festival regulars and have had their fair share of career standouts – including that generation-defining turn at Glastonbury in 1997. Forward the clock twelve years and, a couple of years from In Rainbows; the band had a lot more material at their disposal (than the 1997 turn). They are not regulars at Reading and Leeds and one wonders whether they are due a return to the festival. In 2009; they, rather surprisingly, started with Creep, before producing a minimal, tight set that blew the crowds away and showed the adaptability and variation the Oxford icons could produce through the years. I do not think they have reproduced the configuration they did back then - a unique set that helped make 2009 one of the best in Reading and Leeds’ recent history. There is not much to say about this aside from the fact it was one of the final great performances from the Manchester band. Standing on the Shoulders of Giants was released earlier in the year and, whilst not one of their best albums, there was more demand for their classic material. The band responded with a bombastic and exceptional set that contained the same majesty and command as their early best. Despite the fact their best days were behind them: the band showed they were a consummate and evergreen live band who were capable of bringing the magic year-in-year-out. The band would release three more albums up until 2008 but this was one of their final truly great performances. Many could see the tide was turning but Oasis’ 2000-turn stands as a key moment in their esteemed and vivid history. This set, like so many of PJ Harvey’s, was defined with a lusty and almost-masculine set of Blues/Goth songs – a set that mixed the instantly enthralling and quirky. Clad in a rather ‘memorable’ outfit – you’ll have to dig through photos of her turn – it was a set as memorable by its visuals (as the sonics). All said and done; PJ Harvey showed why she is one of music’s true originals. Nobody was complaining and, even more than that, many were buzzing and talking about her set for weeks to come. She has, perhaps, turned out better sets but Reading had not seen anything as brilliant and baffling from PJ Harvey. 2001 was not the finest years for music – or society, as a whole – but the rare magic only PJ Harvey could provide turned a, potentially average day, into something spectacular. The reason for including Rage Against the Machine for a second time was to show, eight years from that epic decade-starting set, the U.S. band returned and kicked the sh*t out of the stage! Arriving in Guantanamo Bay-style boiler suits: the boys provided a staggering set filled with energy, explosion and nuance. Zach de la Rocha, in a particularly confrontational mood, spoke out against the atrocities and injustices around the world – using the stage as a pulpit on which to preach and educate. This verbal diatribe was matched by Tom Morrelo who, stealing the show, produced some of his finest guitar fireworks and workouts to date. A truly tight, impactful and blissful set from a band, whilst past their recording best, showed they had lost none of their live chops. The Suburbs – the Canadian band’s third album – can be considered one of the final truly great albums. They were not afforded a big crowd in 2010 but, following the freshness of the album (I think it had only been out a few weeks) it was not a big surprise. The technically-perfect and monumental set warranted a big audience but that did not matter: the band put jaws to the floor and showed why they were a critical favourite. This year’s Everything Now is a bit of a downturn from the once-immense band so one wonders whether they will get a chance to return to Reading/Leeds. A band who seem comfortable and confident playing headline sets: a 2002 appearance, to many, is the defining moment of their festival-attending lives. Opening with In Your Honour; they launched into All My Life, Times Like These; My Hero and Best of You – a hits-packed set that wowed the Main Stage at Reading and was the perfect follow-up to their acclaimed album, In Your Honour. At a time when the band was going from strength-to-strength; they could have provided a rather run-of-the-mill set. As it was; the guys upped their games and got the people moshing, jumping and singing. 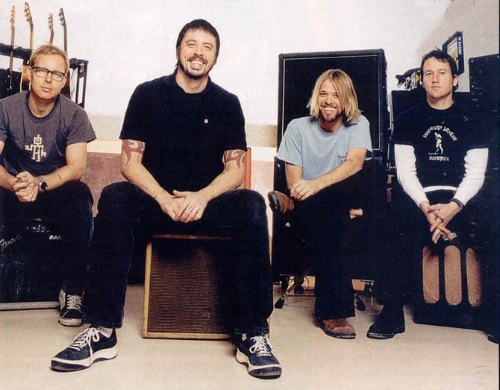 The definition of a perfect Reading set – few bands have managed to rival Foo Fighters’ 2005 spectacular. A year after Foo Fighters tore the roof off Reading: one of music’s most dependable and planet-straddling live acts had a go. The words ‘Muse’ and ‘bad gig’ do not really go hand-in-hand. Matt Bellamy refused to believe they had ‘made it’ until headlining Reading. In 2006, following the release of the sensational Black Holes and Revelations, it was the perfect moment to shine. Huge songs on that album – Supermassive Black Hole and Knights of Cydonia – were fresh in the mind and, with three other albums before that, there were enough epics to get the crowds pumped. Perhaps that is why Muse finally made it in 2006 – an album like Black Holes and Revelations was the final part of the jigsaw that would guarantee a headline-worthy gig. The boys, eleven years after that set, are preparing themselves as we speak. They have rocked Leeds and played a hits-packed set yesterday. The start of their set brought songs from Drones, their current album, together with songs that span their entire career. They provided an encore of Uprising and Knights of Cydonia and Bellamy, in eccentric clothes/shades and at his shredding best ensured everyone went home beaming – bodies aching and ears ringing. The guys will play Reading’s Main Stage tomorrow and are likely to provide a similar set to that of Leeds – it will be a wonderful thing to see. 2006 was a pivotal year for Muse and, faced with the daunting expectation of the Main Stage...did not disappoint.